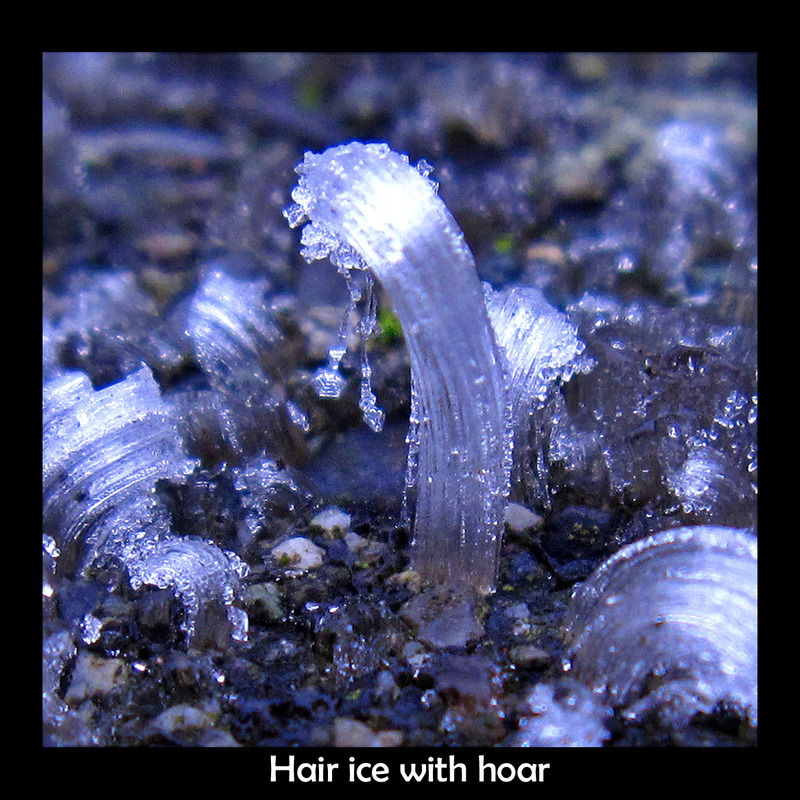 I saw some other hair ice nearby. Although this looks like a lot of water to be coming out of the wood, there actually is relatively little water. After scooping up about a cup and a half of the stuff, I found that it melted down to a little less than a tablespoon. That is, the water essentially expanded about 30 times to produce the hair. Where does hair ice form? In the three cases I found that morning, all were on about 1-3" diameter logs; all were near the ground or other wet objects; all were growing on bark-free regions and growing partly downward. Also, the region was quite soggy. 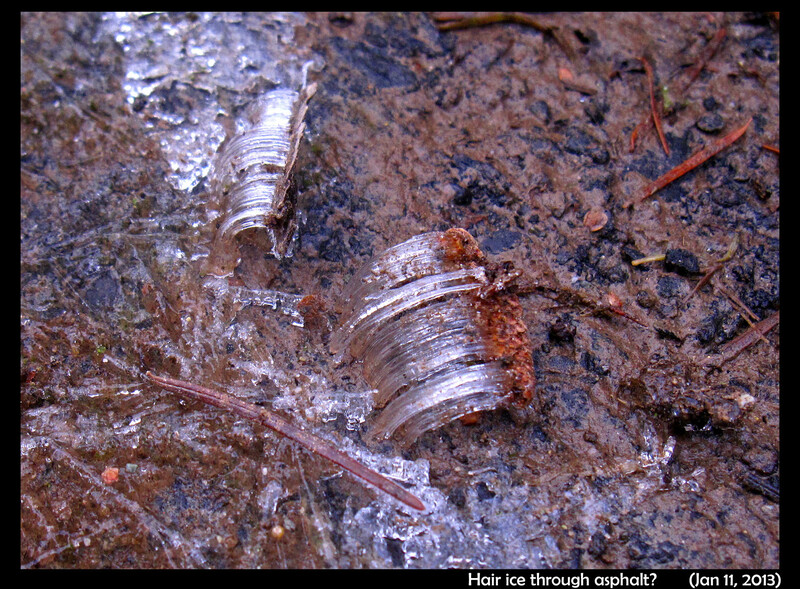 Three days later, also after a fast freeze, I saw hair ice in the same place. Hair ice was a happy discovery for me, as I had been looking for it on wood for years. On a previous occasion, when out looking, I instead found hair ice growing out of a rock. See my account here http://www.storyofsnow.com/blog1.php/2010/01/27/ice-on-the-rocks. 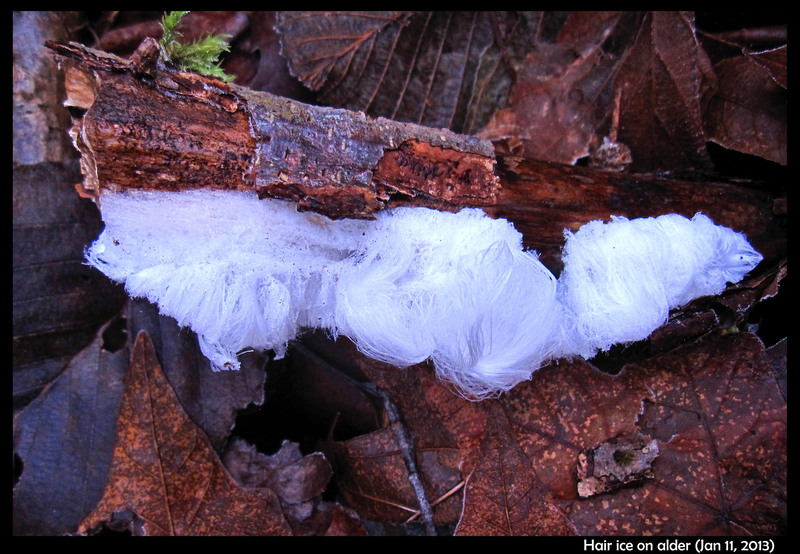 On this day, I also saw hair ice that wasn't growing on wood. A short distance away was a small parking area, and sprouting out of a weathered cement wheel stop was more hair ice. Sure, it was shorter, but still clearly hair-like. The filaments of ice appear thicker than the hair ice from the alder above, but thinner than the ground needles, which form in dirt. 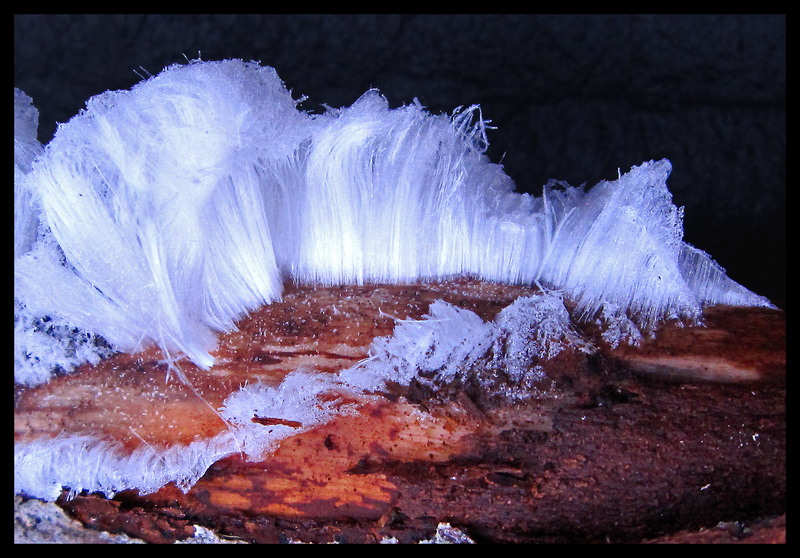 And if one looks closely enough, one can see hoar-frost crystals growing on the hair. See the tabular crystal growing on the drooping end of one filament below. A further surprise awaited me when I saw something similar on asphalt. In the above, it certainly appears that the ice is growing out of asphalt, just like the hair ice and the ground needles that are much more common. I think of asphalt as relatively impermeable to water. Perhaps the ice grew from places having greater wear. So, how does this ice grow, and what pushes it out? 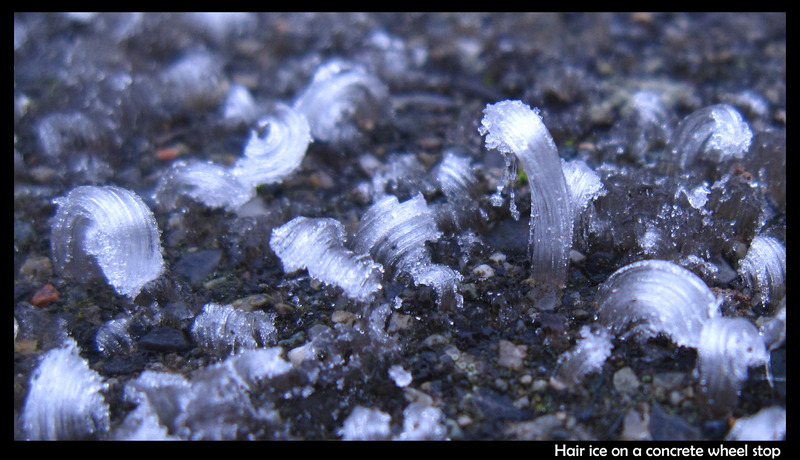 The hair ice forms like the ground needles that make the ground crunchy. It may not be exactly the same, but I think the basic processes are the same. 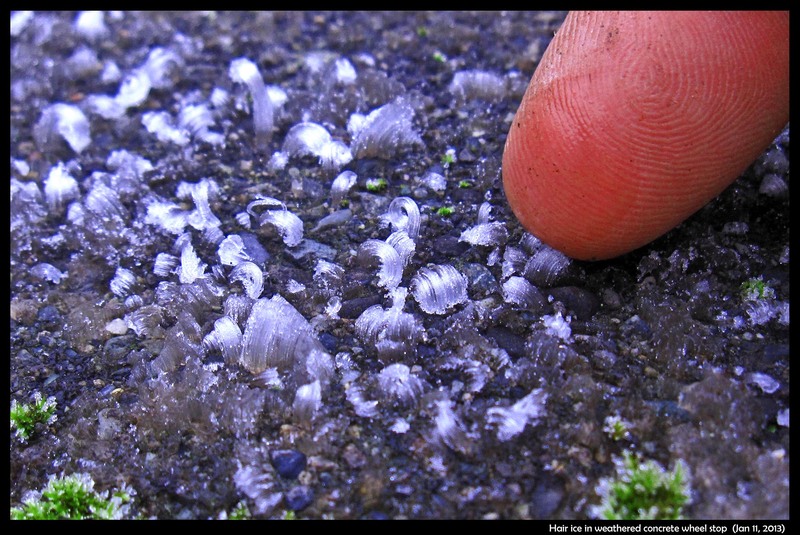 Ground needles form when the top of the ground starts to freeze, but the ice cannot penetrate the fine pores in the soil below. But the fine pores allow melt (liquid water) to flow up to the ice. The basic theory for ground needles is from Stephen Taber in the 1930s, and I sketch it on the upper left in the image below. After a little ice forms on the ground surface, a thin film of water will remain between the ice and the soil grains beneath. As the ice starts growing down between the pores of the soil, the ice surface must curve. But the surface tension of the ice effectively stops the growth. Capillary forces draw water up from below, the water freezes below the ice needle, which decreases the film thickness, increasing the pressure, and pushing the ice up. The same process basically acts to push the hair ice outward from the wood, as shown at the upper right in the sketch. 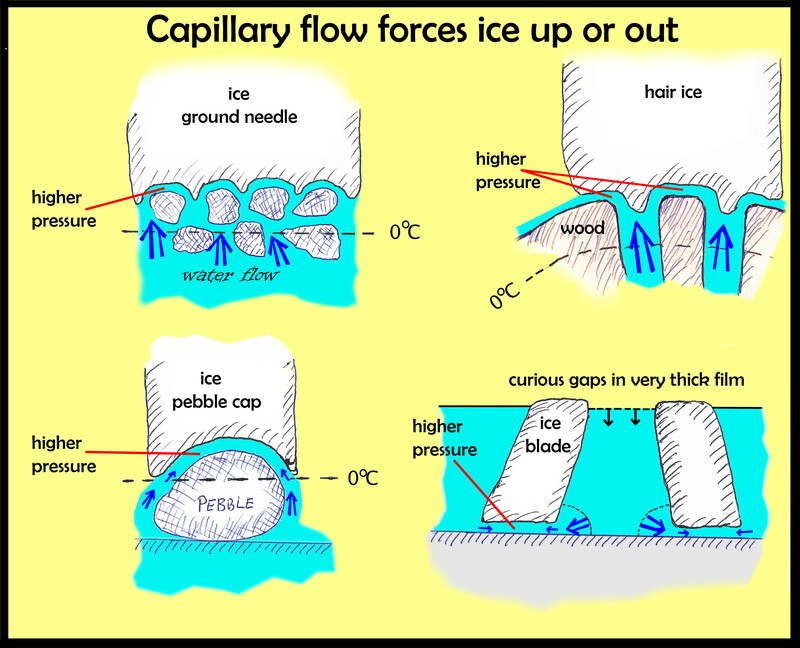 I think that such capillary forcing may help explain other observations of ice that I've described here, such as the gaps in black ice. It might also help explain the curving of film frost. More on that later. jnelson This entry was posted on January 16th, 2013 at 09:15:00 pm by Jon and is filed under Photos, Ice Science, Hair ice, Funny-strange ice.